Romel and I, we LOVE Ampalaya. The kids on the other hand, except for Sarah who is very much like me, they have this uh uh relationship with the green wrinkly vegetable. They’re not really crazy with it, but they appreciate it and eat it for the right reasons. As always, my appreciation to my ever loving and handsome father named Alex, he who taught me how to cook. I remember fondly when I was still in grade school and then in high school how he would call me and my sisters and make us watch him as he prepared our food. He’d tell us which ingredient goes to the pan first, how to cut the vegetables up to maximize its taste and vitamins, and how to season them properly. My parents taught us these: to eat all kinds of vegetables, to enjoy eating them, to cook them in different ways possible, and most importantly, to teach the same to our children. So here goes the ingredients and the procedure on how to cook it! Cover and simmer some more. 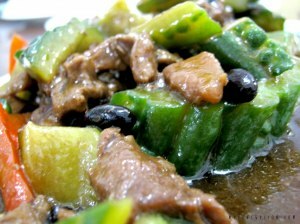 When the meat is already tender, add the red and green bell pepper and the ampalaya.